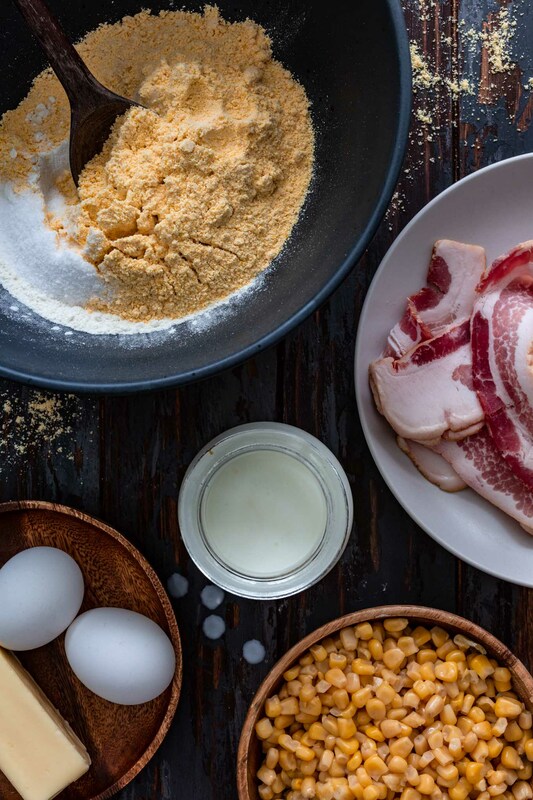 Easy and delicious, this Brown Butter Bacon Cornbread takes your cornbread game to a whole new level! Great as a side dish or by itself as a snack, topped with butter and drizzled with honey. You saw this coming, right? After all, the Double Chocolate Chili that I shared last Monday was in desperate need of an equally delicious sidekick. 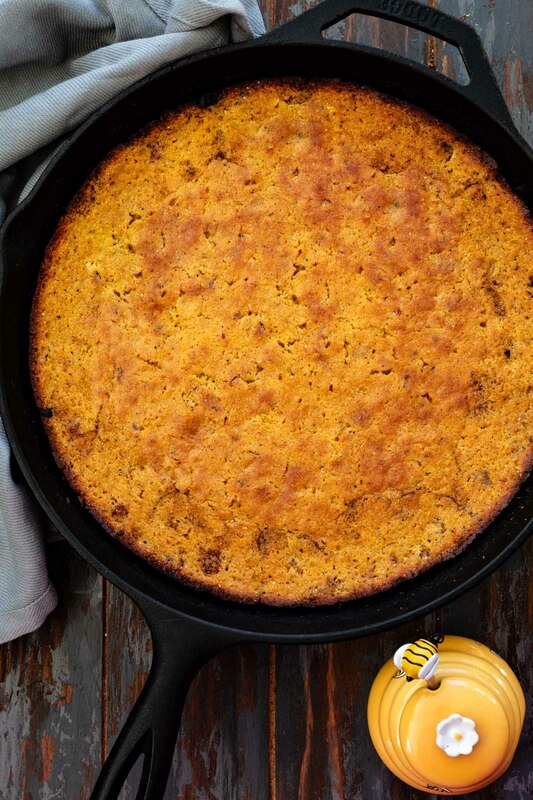 And this bacon cornbread is it, y’all! I recently learned that people can be really passionate and opinionated regarding cornbread. Being a foreigner, I thought cornbread was cornbread and that was it. We have our own version in Brazil, called Broa de Milho, and there are as many varieties as there are grandmothers! I thought it was the same with American cornbread. Well, apparently Southerns and Northerns are constantly arguing about who has the best cornbread. Is it supposed to be sweet? Or savory? Light and fluffy? Or rich and moist? 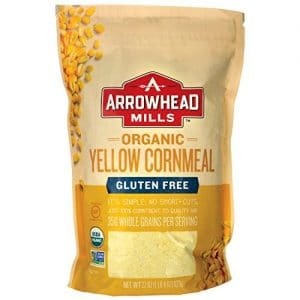 Do you add actual corn kernels? Are add-ins, like bacon or jalapeños, even allowed? Since that can be a touchy subject, I am not making any claims here! This is the cornbread *I* like to eat. It’s rich, sweet, moist, bacon-y and made with brown butter, because – in my opinion – everything tastes better with brown butter! There is nothing wrong with plain cornbread. But why not spice things up and add a few fun ingredients? Life is too short to be bland! The usual suspects: cornmeal, flour, baking powder, baking soda, salt, eggs and buttermilk. 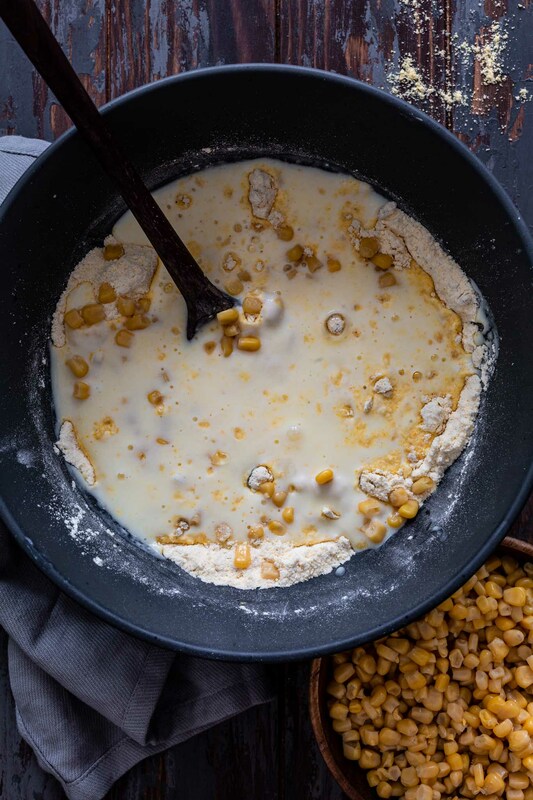 Corn kernels – make the cornbread corn-ier. Brown butter – adds a delicious nutty flavor! 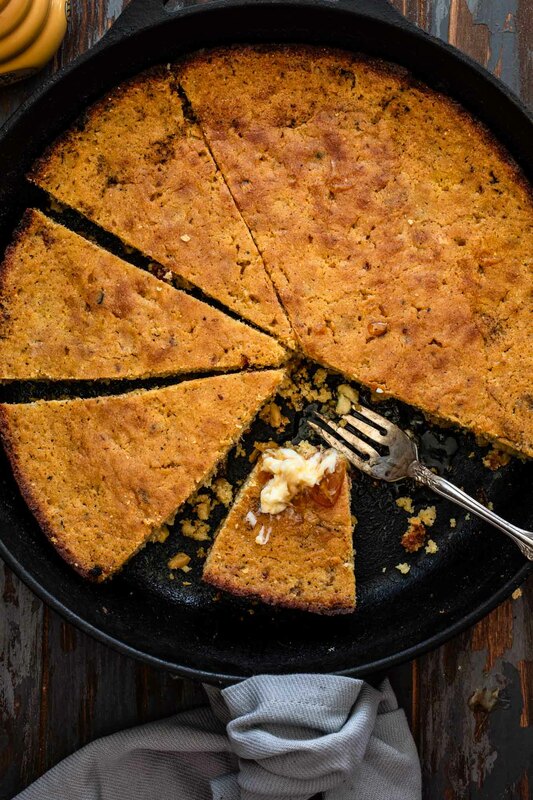 Bacon – the smokiness of the bacon pairs perfectly with the sweet cornbread. 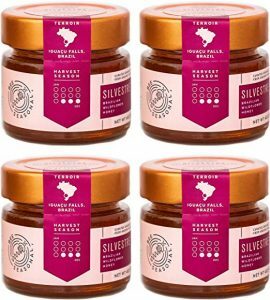 Brown sugar – enhances the natural sweetness of the corn and makes the cornbread softer. Honey – contributes with an extra dose of sweetness! For me, the best cornbread is crusty on the outside while moist and creamy inside. 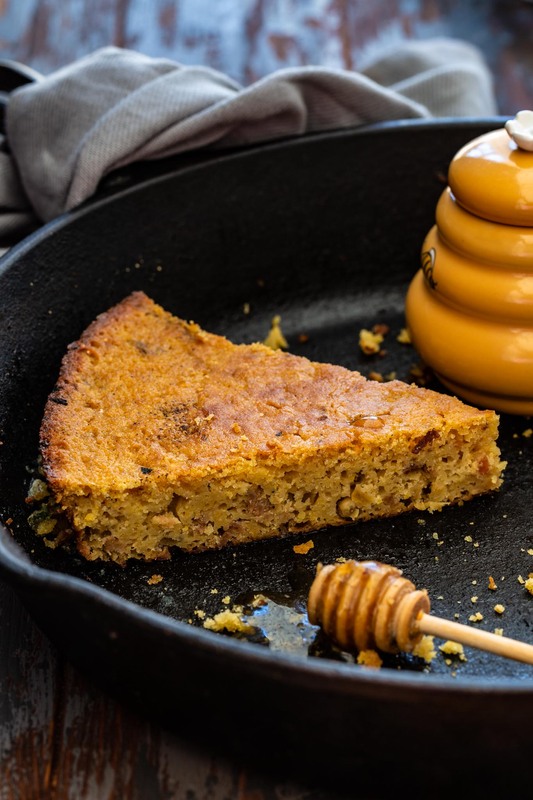 The best way to make that happen is to bake the cornbread in a hot cast iron pan. Pouring the batter into a hot skillet – and hearing that satisfying sizzle – is what helps develop that beautiful crispy crust. Most recipes will tell you to preheat the cast iron skillet in the oven. No need to do that here, since we will use that same skillet to cook the bacon and to brown the butter, therefore already seasoning and heating the pan! It should stay hot enough until you are ready to pour the batter, but – if not – just put it back on the stove and heat it up until hot again. Be careful not to over mix the batter as that can make the cornbread tough! After browning the butter, pour it into a bowl and wait for it to cool slightly before mixing the other ingredients. You don’t want to end up with scrambled eggs in your cornbread! Yuck! Use fresh corn kernels, whenever possible. However, if not in season, canned or frozen will do! No buttermilk? No problem! You can make your own by mixing 1 tablespoon of white vinegar or lemon juice with 1 cup of room temperature milk. Let it sit for 5 minutes and it’s ready to use! Can bacon cornbread be made ahead of time? How long does it last? While cornbread tastes best right out of the oven, you can make it up to 2 days in advance and keep it on the counter, covered with a towel. If you want, you can reheat it in the oven (350 degrees F) for a few minutes for that “out of the oven” feel! The crust won’t be as crisp, but it’s still delicious! Yes, cornbread freezes well. Just make sure to cool it to room temperature before freezing! Store it in an air-tight freezer safe container and freeze for 1 to 3 months. When ready to eat, thaw it in the fridge overnight and then reheat in the oven. What do you eat with cornbread? Other than the obvious butter and honey, cornbread goes great with chili, BBQ meats, pulled pork, fried chicken, soups and stews! Leftover cornbread? You can use it to make croutons, bread pudding, French toast, stuffing and cornbread crumbs! Cook the bacon. In a 11 or 12-inch cast iron skillet, over medium heat, cook the bacon until crispy. Remove the bacon and, once cool enough to handle, crumble or chop. Reserve. Brown the butter. Remove all but one tablespoon of the bacon fat from the skillet. Add butter and cook, swirling pan to coat the bottom and sides, until it develops a deep nutty brown color. Be careful not to burn the butter! Mix the batter. Transfer butter into a large bowl and reserve the hot cast iron pan for later. Whisk in the honey and then the buttermilk. By now, the mixture should be cool enough. If not, let it cool further before adding the eggs so they don't cook. Add the eggs and whisk to combine. Then whisk in all the dry ingredients, being careful not to over mix. Using a wooden spoon, stir in the corn kernels and reserved crumbled bacon. Pour batter into skillet. 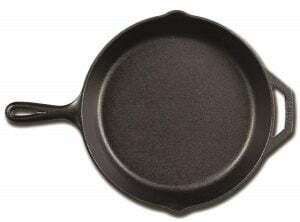 The cast iron pan should still be hot. If not, reheat briefly on the stove for a few minutes. Then, pour the batter into it, listening to that wonderful sizzle! Smooth the top with a spatula, if necessary. Bake! Bake in the preheated oven for 20 to 30 minutes or until a toothpick inserted in the center comes out clean and the top is golden brown! Let it cool down slightly! Cool in the skillet for 10 minutes before serving. For a thicker cornbread, use a smaller pan size.